No. 25, 27 & 29, Jalan TIB 1/19, Taman Industri Bolton, 68100 Batu Caves, Selangor, Malaysia. 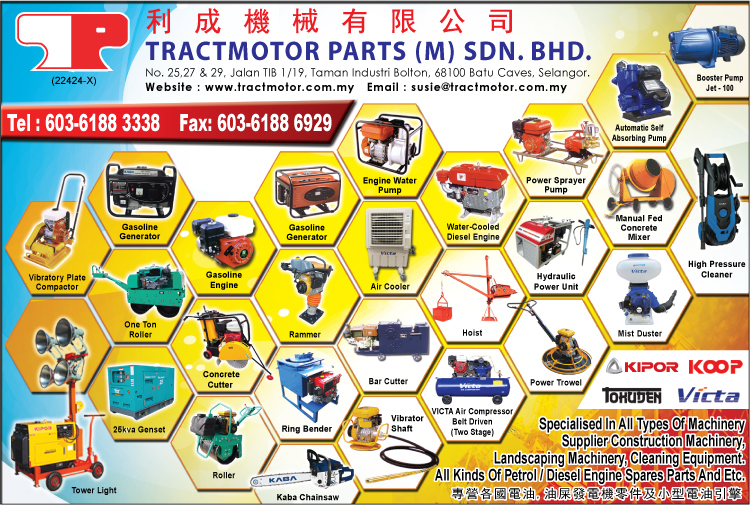 Tractmotor Parts (M) Sdn Bhd supplies a wide range of machinery and equipment for agricultural, automotive, manufacturing and residential purposes. Our company is established in year 1975 and we have been proactively providing up to date technology of machinery and equipment supplies to our customers. We are the importer and distributor of a few renowned brand names of machinery and equipment from all around the world. These products are manufactured by trusted and well known companies from countries such as Japan, China, Australia, India and Taiwan. We take pride to be the distributor of such brands as we are capable of supplying high quality and efficient machinery and equipment to our customers in related fields. 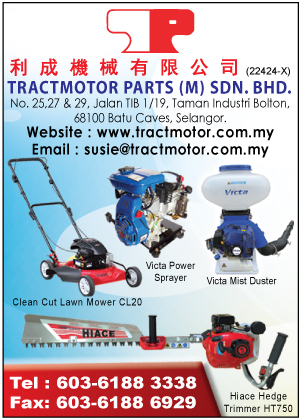 Tractmotor is focused on supplying machinery and equipment with high functionality. We have a team of skilled staffs who are ready to serve our customers pertaining to all technical matters. We are committed to provide and serve our customers with high quality machinery and equipment for their needs.